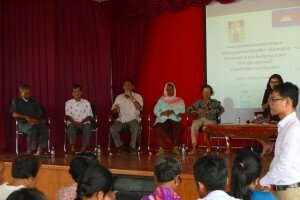 Discussion between ethnic civil parties and Khmer students. 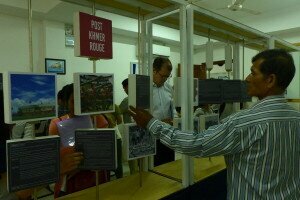 The Civil Peace Service (CPS) partner organization “Kdei Karuna” launched their exhibition Voices of Ethnic Minorities in Phnom Penh on 20 November 2016. The exhibition documents the persecution and suffering of Muslim Cham and ethnic Vietnamese during the Khmer Rouge regime from 1975 to 1979. With funding of the CPS of GIZ, Kdei Karuna has collected oral history accounts of ethnic minorities. Telling the history through a combination of personal stories and well selected historical information, around 40 university students were invited to learn how the Khmer Rouge rigidly suppressed Muslim religious practices and traditions, killing those who would not give up their belief. 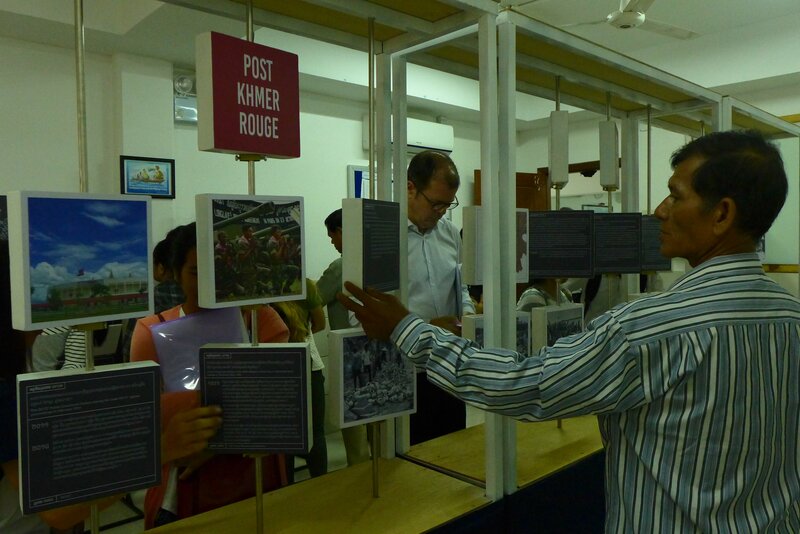 Other exhibits recounted the killing of ethnic Vietnamese spouses who refused to leave their Khmer families and be deported to Vietnam along with around 170.000 ethnic Vietnamese who had been living in Cambodia for several generations. The exhibition utilized interactive exhibits to involve the spectators, offered visual and acoustic documents as well as space for reflection and feedback. After the visit to the exhibition, 16 survivors of Cham, Vietnamese and Khmer ethnicity shared their experiences and answered the questions of the students. In order to link injustice and grievances from the past to present-day issues of exclusion and discrimination, students were then invited to reflect on their views of Cham and ethnic Vietnamese in Cambodian society today. By engaging Khmer youth to deal with the past of their parents’ generation, Kdei Karuna strives to contribute to a more peaceful and socially and culturally inclusive Cambodia. The majority of the ethnic Khmer Rouge survivors attending the exhibition launch have been recognized as civil parties in case 002/02 at the Extraordinary Chambers in the Courts of Cambodia (ECCC) in which charges of genocide against Cham and ethnic Vietnamese have been heard. Voices of Ethnic Minorities – Promoting public awareness about the treatment of ethnic minorities during the Khmer Rouge Regime has been submitted as a reparation project to the ECCC. The exhibition will tour Cambodia in 2017 and engage local youth, civil parties and Khmer community members in dialogue forums.